You've always been a hard worker. Morning sickness shouldn’t change that. When diet and lifestyle changes aren’t enough to control your morning sickness, there’s Bonjesta®. Bonjesta® is designed to be a fast-acting, long-lasting prescription medication that is FDA-approved for the treatment of morning sickness when diet and lifestyle changes don’t work. Bonjesta®’s multilayer, extended-release tablets are designed to provide rapid and continuous relief of morning sickness symptoms throughout the day and night. Bonjesta® contains a combination of the ingredients doxylamine succinate and pyridoxine hydrochloride that have a 60+ year record of safety for mother and baby. Bonjesta® has not been studied in women with hyperemesis gravidarum. It is not known if Bonjesta® is safe and effective in children under 18 years of age. 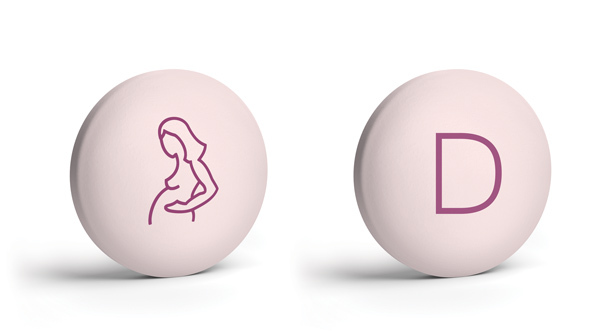 Tablets are pink with the image of a pregnant woman on one side and a “D” on the other. Tablets shown not actual size. Based on the Pregnancy-Unique Quantification of Emesis (PUQE) Score, which evaluates the overall severity of morning sickness: hours of nausea, instances of vomiting and retching over a 24-hour period. Jana Kramer and Dr. Jay Goldberg are paid spokespersons for Duchesnay USA. Morning sickness is also known as “nausea and vomiting of pregnancy” and its symptoms may last well beyond the morning. The symptoms of morning sickness can range from mild to severe nausea, gagging, retching and vomiting. You can use the PUQE Score to help you and your healthcare provider assess your morning sickness symptoms. This will help you get your symptoms under control so you can get back to being you. When changing your diet and lifestyle does not relieve your symptoms, it may be time to ask your healthcare provider about Bonjesta®. How do I take Bonjesta®? Dr. Masterson is a paid spokesperson for Duchesnay USA. Scientific studies show that the combination of ingredients in Bonjesta® does not increase the risk of birth defects, even when taken in the first trimester. Also, the American College of Obstetricians and Gynecologists (ACOG) actually recommends the combination of ingredients found in Bonjesta® as the first treatment to try if diet and lifestyle changes don’t work. Note: Safety and efficacy studies are based on trials conducted on the combination of ingredients in Bonjesta®, not on Bonjesta® itself. Bonjesta® was specifically developed for pregnant women and its combination of ingredients has been proven safe for you and your baby. What are Bonjesta®’s side effects and safety considerations? The most common side effect of Bonjesta® is drowsiness. Do not drive, operate heavy machinery or engage in other activities that need your full attention unless your healthcare provider says that you may do so. Do not drink alcohol or take other central nervous system depressants, such as cough and cold medicines, certain pain medicines and medicines that help you sleep, while taking Bonjesta®. Severe drowsiness can happen or become worse, causing falls or accidents. These are not all of the possible side effects of Bonjesta®. Please see full Patient Information. You are encouraged to report side effects to the FDA at 1-800-FDA-1088. What are the potential concerns about over-the-counter (OTC) products? You may be tempted to try products available at your local pharmacy, but keep in mind that not all medications are safe to take during pregnancy. Bonjesta® is intended for use in pregnant women. It is not known if Bonjesta® is safe and effective in children under 18 years of age. Before taking Bonjesta®, tell your healthcare provider about all of your medical conditions, including if you: (1) have asthma; (2) have eye problems called increased intraocular pressure or narrow angle glaucoma; (3) have a stomach problem called stenosing peptic ulcer or pyloroduodenal obstruction; (4) have a bladder problem called urinary bladder-neck obstruction; (5) are breastfeeding or plan to breastfeed. Bonjesta® can pass into your breast milk and may harm your baby. You should not breastfeed while using Bonjesta®. How should you take Bonjesta®? Talk to your healthcare provider about how much Bonjesta® to take and when to take it. Take Bonjesta® everyday as prescribed by your healthcare provider. Do not stop taking Bonjesta® without talking to your healthcare provider first. Do not take more than 2 tablets (1 in the morning and 1 at bedtime) each day. Take Bonjesta® on an empty stomach with a glass of water. If you take too much Bonjesta® (overdose), you may have the following symptoms: restlessness, dry mouth, the pupils of your eyes become larger (dilated), sleepiness, dizziness, confusion, fast heart rate, seizures, muscle pain or weakness, urination changes and build-up of fluid in the body. If you have these symptoms and they are severe, they may lead to death. If you take too much Bonjesta®, call your poison control center at 1-800-222-1222. What are the possible side effects of Bonjesta®? Do not drive, operate heavy machinery, or do other activities that need your full attention unless your healthcare provider says that you may do so. Do not drink alcohol, or take other CNS depressants such as cough and cold medicines, certain pain medicines, and medicines that help you sleep while you take Bonjesta®. Severe drowsiness can happen or become worse causing falls or accidents. Bonjesta® may cause an incorrect positive result for urine drug screening tests for methadone, opiates and PCP. ©2018 Duchesnay USA Inc. Bonjesta is a registered trademark.